Here at Copper Canyon Homes, LLC in Las Cruces, New Mexico, we love what we do and what we do is design and build some of the areas most extraordinary as well as functional custom homes. We take great pride in our workmanship and each house is truly a labor of love. William & Maxine Webber are the design/build team behind Copper Canyon Homes, LLC. We believe that foresight is the key ingredient to the success of the finished home. We achieve that by handling the process from start to finish and designing the home exactly the way you want it. 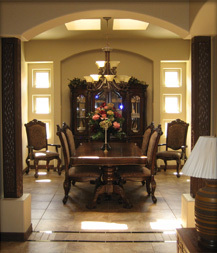 We have been designing floor plans since 1993, for most of Las Cruces' custom home builders. We also do remodels and additions as well. We work with the finest and most honest sub-contractors Las Cruces has to offer. We will keep you apprised of the building process at all times. Because quality is so important to us, we do not have a foreman overseeing our jobs. We are both on the job site every day, and every step of the way. As a matter of fact, William does much of the hands-on work as well, as he has many years of experience in every phase of building. Our plans are all one of a kind, designed specifically for you, and incorporating many architectural treatments, such as niches, arches, beams, ceiling treatments and other details. Let Copper Canyon Homes LLC, become your custom home builder and welcome you home!